Don't overestimate my cooking. I eat outdoors a lot like you too. The Turkish and Kurd cafeteria of Arnhem become rich of me, because I love their Kebab, Shawarma dishes, Fallafel, and Kapsalons. I also love to go to Dutch restaurants to eat a stake every now and than. And Piza's, Haburger menu's, Quarter pounders, Big Macs, Whoppers, Chicago burgers, cheese burgers, chicken burgers, a Dutch Frikandel, and Dutch fries (Fries with mayonaise and ketchup, or fries with peanutbutter saus and onions). I am not the most healty eater and sometimes have to force myself to eat healthy and cook for myself. Take a way dinners from the supermarket for my microwave oven are a temptation too. Thank god my mycrowave has passed away and I didn't replace him, so I force myself to cook healthy when I am at home. Pieter, I don't really like fries, although here in Idaho fries are popular due to potato industry. 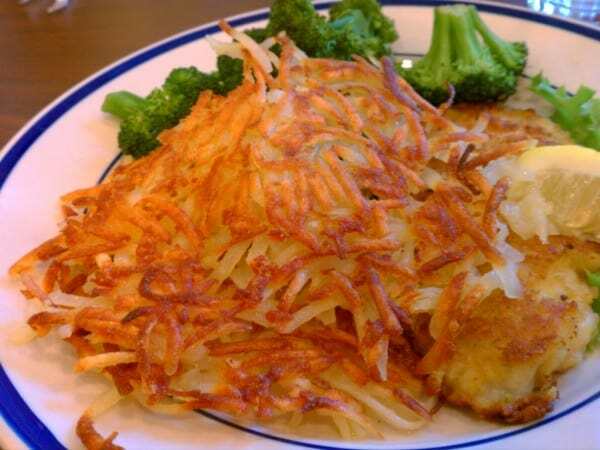 He also have hashbrowns which are delicious.